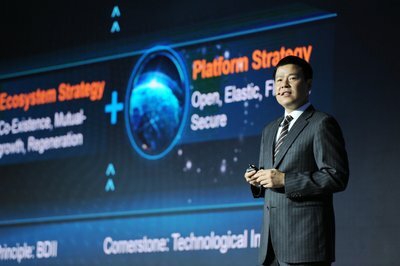 Huawei held its fifth Global Financial Summit themed “Leading New ICT, Fueling Digital Finance Transformation” in Beijing, China. Bringing together over 800 foreign and domestic finance customers and industry experts, including China Construction Bank (CCB), Agricultural Bank of China (ABC), China Merchants Bank (CMB), Asian Banker, Barclays, Intel, and Infosys, the Summit explored the latest ICT innovations and global best practices to accelerate digital transformation of financial institutions. -Yao Huiya, Head of Innovation Research, Webank, believes that: “Cloud is the best delivery method for financial technological innovation.” Based on an efficient, open and self-managed IT infrastructure platform, Webank joined hands with Tencent Cloud to build a complete “cloud + bank” ecosystem that supports normalized financial technology innovations, provides enhanced financial services to small businesses and consumers, and delivers “SaaS+” (Software-as-a-Service + industry) to enterprises in the finance and other traditional industries. During the Summit, ABC and Huawei signed a strategic partnership agreement. Under the agreement, Huawei will optimize and integrate architecture within ABC’s multiple data centers and service centers to support its growing international operations. In addition, Pactera and Huawei jointly released a distributed digital banking core solution targeting mobile finance, which will meet the diverse customer requirements for mobile banking and internet financial services. Huawei showcased 12 major solutions for the financial industry through scenarios and interactive demonstrations in three large sub-exhibition areas: “Cloud Finance”, “Big Data Finance”, and “Omni-channel Finance”. Huawei’s solutions for the financial industry have been deployed by more than 300 financial institutions globally, including six of the top ten banks in the world. In Europe, Asia Pacific, Russia and other regions, Huawei’s leading solutions have been deployed by local mainstream financial customers; in China, Huawei has become the IT equipment supplier of the four major state-owned banks.